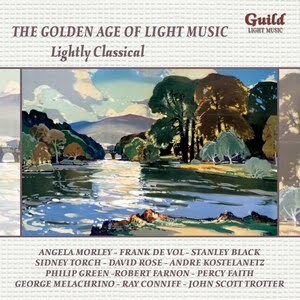 This collection has been prepared with three main aims: firstly to prove that the so-called boundaries between light and classical music are not as insurmountable as some people seem to imagine; secondly to illustrate that many composers, who may usually be associated with more serious works, also had their lighter moments; and thirdly to offer several examples of the tasteful way in which arrangers of the 20th century adapted the classics to make them more instantly appealing to their audience. For many years such ‘tampering with the classics’ was banned by the BBC in Britain, although commercial recordings could be freely purchased. However a lack of broadcasts obviously affected sales, which partly explains why such recordings were more common in the United States than in Britain. Among the leading US musicians who often strayed into classical territory were David Carroll,Andre Kostelanetz, Percy Faith, Clebanoff and even Ray Conniff. They are joined by Charles Williams, Angela Morley and other familiar figures on the UK scene.